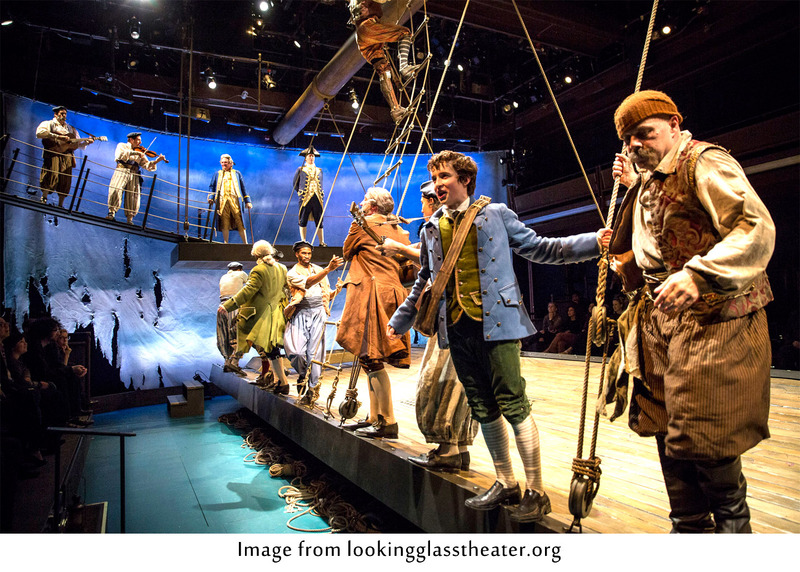 Every ticket purchased for a Mary Zimmerman play carries the promise of her unique approach to theater, and Lookingglass’s production of Treasure Island (adapted and directed by Zimmerman) is no exception. The completely unique set is on display from the moment audience members are allowed to take their seats. The center of a 19th-century sailing vessel, complete with planking and rigging, is suspended by sturdy ropes across the entire width of the theater. As the show progresses, the actors use every dimension of their stage including the height as they scamper up and down the nets while delivering lines. The actors step away from their roles to turn the vessel into a swinging pendulum rocked by the ocean’s waves. The content of Treasure Island is more drab than many of Zimmerman’s other adaptations, which feature such unforgettable images as Metamorphoses’s pool filled with floating candles and Silk’s panoramic of Japan’s feudal countryside. Treasure Island, however, delivers pure beauty during its climactic visual highlight, which involves dropping gold foil simulating a cave overflowing with Pirate Flint’s hidden treasure. This scene occurs late in the second act—Zimmerman and her designers save the best for last. Zimmerman’s other unique fingerprint is her collaboration with actors. Many interviews speak to her process in creating a show, which involves significant revisions to her script based on actors’ feedback. The actor tasked with the complex narration is John Francis Babbo playing Jim Hawkins, the narrator and protagonist of the novel. This teenage adventurer finds himself in the center of a race between British aristocrats and pirates—both trying to claim Pirate Flint’s hidden treasure. Babbo is a Chicago theater veteran that was only 14 when this production started, and he is challenged with carrying the most lines of any actor—often at breakneck speeds while hanging from various ropes above the set. Philip R. Smith is a cast standout as Captain Smollett, a British sea captain so stuffy that he practically irons his uniform and sips tea while pirates aim cannonballs at his head. Lawrence E. Distasi embodies the archetypical pirate Long John Silver with his trademark wooden leg and parrot created through a distinctive costume and puppetry. Distasi, an actor with more than 30 Lookingglass credits, can be hit-or-miss. He has a tendency to overpower his fellow cast members with his full-throated bellowing of dialogue. In Treasure Island, he is at his best during scenes when his soft charism creates a pseudo-father figure for Jim. His crazed-pirate scenes drag. However, Distasi is not alone is reaching too far in his portrayal of a pirate. For almost every actor, playing a pirate means stating dialogue with a booming yell—as if they were actually competing against crashing ocean waves. These vocals are too often frustrating as Babbo’s narration (already somewhat difficult to understand due to an over-stated British accent) is drowned out by the less interesting interjections of the pirate ruffians. Also, Zimmerman allows three different conversations between Jim and minor characters to run far too long. Fifteen minutes less would have been far more for Treasure Island. As always, set design and visuals rule in an exciting Mary Zimmerman adaptation. This might not be her tightest script, but it did leave me eager to pick up the novel so I can match the amazing spectacles to Robert Louis Stevenson’s original words.